Parents should be concerned if their children develop an unhealthy obsession about their weight. The most common eating disorders are anorexia, bulimia, and binge eating. 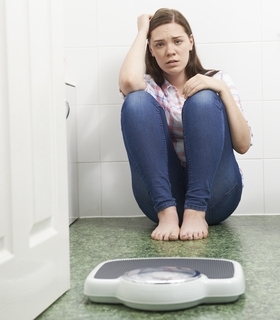 Eating disorders can be life-threatening and require professional help to overcome. Unfortunately it isn’t unusual for children, especially teens and preteens, to feel self-conscious about their bodies. One survey found that among girls 9 and 10 years old, 40 percent have tried to lose weight. Another study showed that 53 percent of 13 year-old girls are “unhappy with their bodies.” By the time they are 17, this figure grows to 78 percent. If your child has a negative body image, you should be concerned. But parents should be especially worried if their children develop an unhealthy obsession about their weight. When people fixate on negative thoughts about their bodies, they can develop unhealthy feelings about their weight, food, and eating habits. This can put your child at risk of developing eating disorders like anorexia or bulimia. Eating disorders are serious and can interfere with your child’s daily life and healthy development. Obsessions with food and eating can take over a person’s life. And eating disorders can cause health problems like malnutrition, dehydration, heart problems, and kidney failure. In extreme cases they can lead to hospitalization or even be life threatening. It is estimated that about one thousand women die each year from anorexia and that one out of ten women in college has an eating disorder. Anorexia: People with anorexia have a distorted view of their body weight and shape. Even when they are severely underweight, they still feel overweight. As a result they use extreme measures to control weight gain like excessively limiting calories, extreme exercising, fasting, and an inappropriate use of laxatives or other unhealthy dieting techniques. Bulimia: Like anorexia, people with bulimia fear gaining weight and have a negative perception of their body. However, their weight does not typically get as low as with anorexia. People with bulimia feel guilty about eating, but they also feel like they can’t control how much they eat. This results in a cycle of binge eating (eating large amounts of food) and purging (getting rid of the extra calories by inducing vomiting). However, not all people with bulimia use vomiting to purge calories. Some will use methods like laxatives, excessive exercise, and other unhealthy dieting techniques to get rid of the calories quickly. Bulimia can cause stomach pain, tooth decay, and kidney and stomach damage. Eating disorders can develop from a variety of things—genetics, social pressure, traumatic experiences, and psychological issues like anxiety or obsessive-compulsive disorder. The most common age for an eating disorder to start is 11 to 13, but they can also start sooner. Girls are more likely to develop an eating disorder than boys. Eating disorders sometimes surface when people feel out of control and seek to establish a sense of control by focusing on their weight. What should I do if I think my child has an eating disorder? If you think your child has an eating disorder, get help. Children can be better at hiding things than you think, so be observant and trust your instincts. Eating disorders are serious and can be life-threatening. These behaviors aren’t easy to stop without help and the earlier you intervene, the better. Both you and your child will need help. How can I prevent eating disorders? Parents can help prevent eating disorders by helping their children build a health body image. The best way to do this is to teach your children that healthy is more about how they feel and less about how they look. The reason for eating healthy and being active should be to grow up strong and healthy, not to obtain an ideal weight or body shape. Parents should also avoid power struggles over food and being overly critical about their own physical appearance. But if your child has a problem, don’t wallow in guilt or get stuck on what you might have done to cause it. Eating disorders are complicated and research indicates that they have a strong biological root. Instead of assigning blame, focus your energy on getting the help your family needs.